Tha room was colorfull and clean. They had the AC on so the room had perfect temperature. The staff was helpful and kind. Location, location, location. 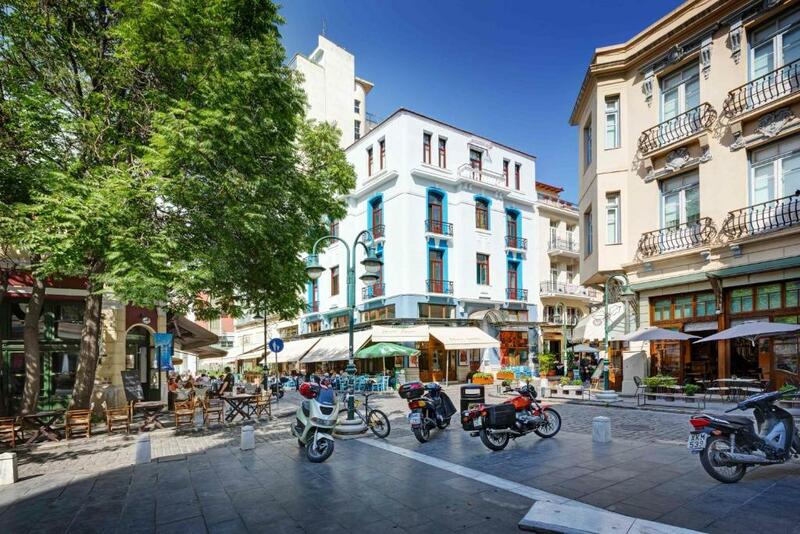 Right in a charming square in the Ladadika district, the old town of Thessaloniki. Cobblestone streets and charming restaurants surround the hotel, and Modiano Market is a must-see and only an 8 minute walk. The beginning of the oceanfront boardwalk is 30 seconds from the hotel and you may then walk 20 minutes for the nicest length of the boardwalk along the oceanfront to historic white tower. Nice shopping district parallels the boardwalk two blocks away from the waterfront, also starts close to the hotel. Windows of our room opened completely to view part of the square (diagonally), and ocean and mountains and the distance over rooftops. This would be an amazing place to stay for solo travelers or couples without kids. Very good location, friendly staff, clean and comfortable rooms. Very good location. The room and the bathroom are very clean. The stuff is very helpful. Location, Location, Location. Supprr friendly staff, ready to help. No coffeee. Wifi sketchy. Tv poor. Resto at other colours resto is not great. Slow service. The location was absolutely perfect as it was near some of the best restaurants in the city. You could step outside the doors to the hotel and you could find anything you could imagine to eat. Be prepared for a full meal though, there may be one restaurant in the area (within 5 minutes of easy walking) that will make a quick meal/takeaway meal for you. The hosts and hostess were extremely helpful even when we had difficult requests to make. We got a voucher for 15% off cocktails and massage services and really wish we had had more time to take advantage of these offerings when we were there, so learn from our mistake and pamper yourself! Round a lot of bars and restaurants to eat. Very close to the port to reach the ferry for next journey. Cca 200 m to the bus (79) line station which goes straight to the airport. Very friendly staff. Lock in a great price for Colors Ladadika Thessaloniki – rated 8.5 by recent guests! 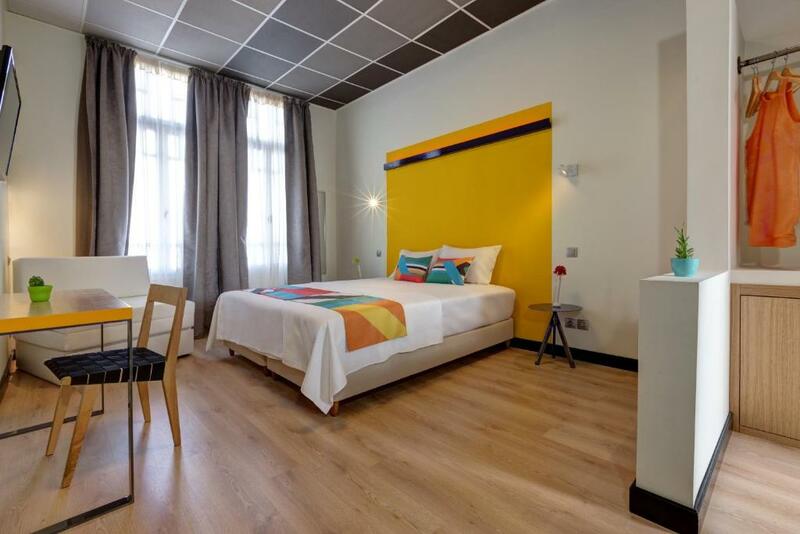 Enjoying a central location, in the lively area of Ladadika in Thessaloniki, Colors Ladadika Central offers minimally decorated rooms with free Wi-Fi access. Within walking distance, you can reach the many tavernas and restaurants of Ladadika. 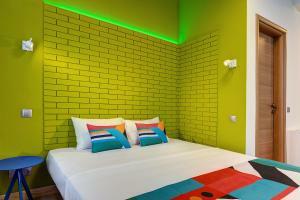 The air-conditioned rooms at Colors Ladadika are decorated in lively colors, while some open out to a private balcony. Featuring mood lighting, they are equipped with a 32" LED TV, mini fridge and hairdryer. All rooms also have a living area. Breakfast can be enjoyed in the privacy of your room. The property offers luggage storage, safety box, room service and an elevator on the 1st floor. The seafront, as well as the port of Thessaloniki, are just a few steps away from the hotel. A delicatessen bakery store is right next to the property. Makedonia International Airport is around 12 mi away, and transfer to and from the airport can be arranged upon charge. The reception can arrange private parking in external parking lots upon request at extra charges. 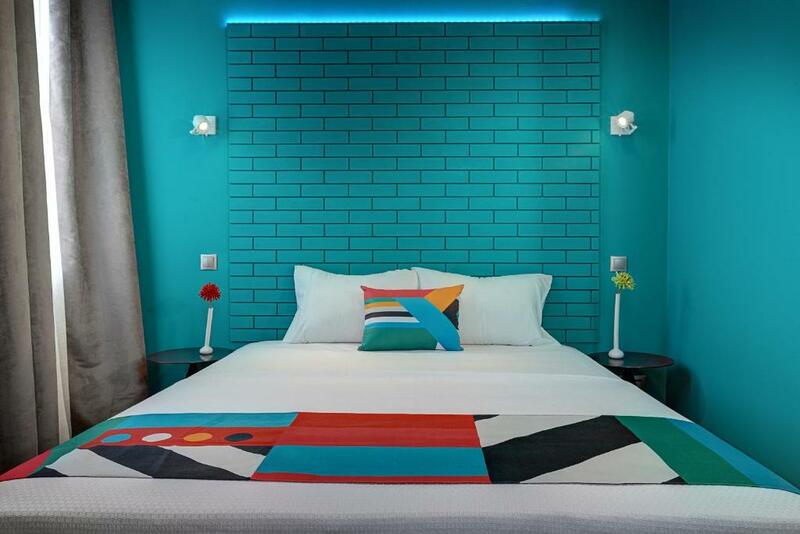 When would you like to stay at Colors Ladadika Thessaloniki? 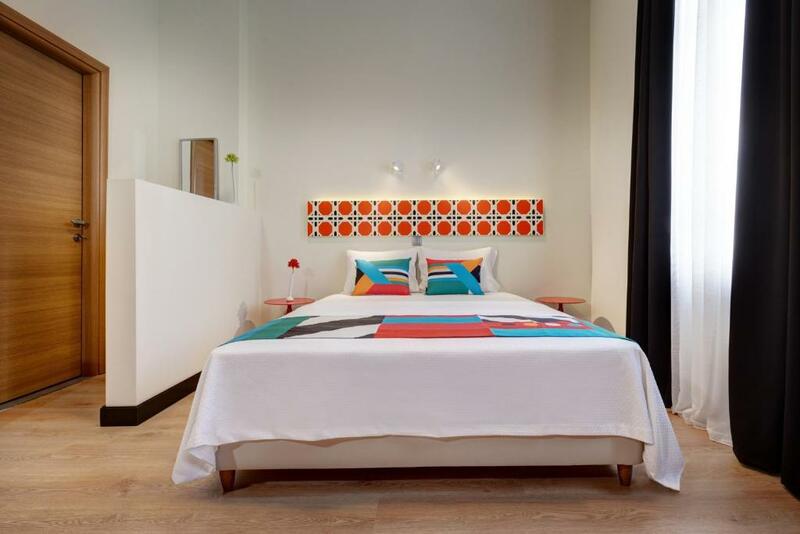 Modernly and minimally decorated, this room features a 32” LED TV, mood lighting, mini fridge and free Wi-Fi. Please note that the sofa bed in this room type is double. A balcony is included upon availability. 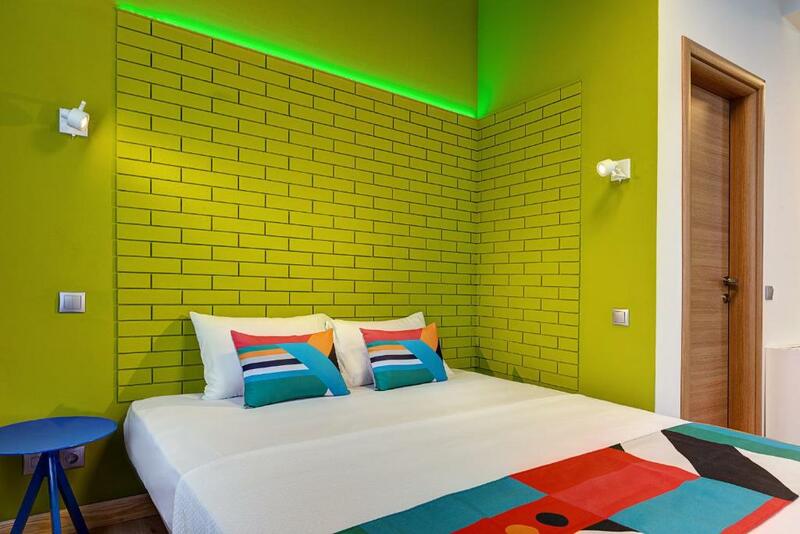 This bright room features a modern decoration and comes with a 32” LED TV, mood lighting, mini fridge and free Wi-Fi. A balcony is included upon availability. 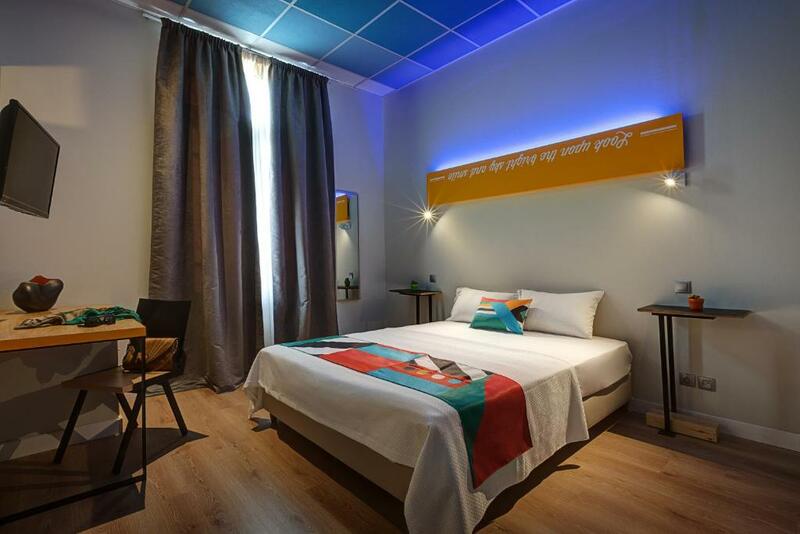 Overlooking the fountain of Ladadika, this room features an urban decor and comes with Fair Trade bathroom amenities, a 32” LED TV, mood lighting, mini fridge and free Wi-Fi. Most units have a balcony. Please note that a room with balcony may be provided upon request and is subject to availability. 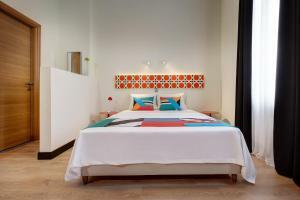 This stylish and minimally decorated room comes with a 32” LED TV, mood lighting, mini fridge and free Wi-Fi. Most units have a balcony. COLORS Ladadika Central is situated in the heart of the center's most beautiful neighbourhood in a listed building from the eary 1900s. The charming building houses 12 different COLORS rooms in three storeys. COLORS is a family-owned business that first opened in January 2012 in Thessaloniki and is growing continuously. The area of Ladadika is the only neighbourhood in the city center that has been listed and preserved in its original form, since the beginning of the 19th century. The stone-paved streets, the small alleys, the historical buildings and the lively atmosphere have made Ladadika Thessaloniki's favourite walk. One can visit the numerous restaurants, cafes, musica bars and picturesque stores in the area or walk in the district of Thessaloniki's harbour. House Rules Colors Ladadika Thessaloniki takes special requests – add in the next step! Colors Ladadika Thessaloniki accepts these cards and reserves the right to temporarily hold an amount prior to arrival. Hotel Accessibility: Colors Ladadika Central is housed in a listed property and there is a flight of stairs until you reach the guests' elevator on 1st floor. Please note that the property is not wheelchair accessible. Kindly note that rooms with balconies may be available to smokers, upon request. Breakfast is offered at discounted rates to children under 12 years old. Kindly note that Colors Ladadika Central is a nonsmoking property and smoking is strictly prohibited in all indoor areas. Guests who would prefer a room with a balcony in order to smoke outside, are kindly requested to contact the property in advance. Water shut off overnight hours without warning, they must have been fixing some Plumbing...but this didn't interfere with showers the next morning. 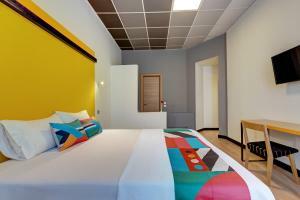 Friendly staff, modern design combined with traditional architecture, comfortable and clean overall very convenient. I have stayed many times in this hotel, but it seems with the years it had lost quality. The budget room was with so many defects, the bathroom had no functioning ventilation and because it had no window it smelled bad, the toilet was constantly leaking water and because of the glass door it was kinda of annoying to sleep during the night. Overall I was disappointed! you need to walk up a flight of stairs to reach the elevator but this is common in Europe's city center. Nothing really. Some people may be put off by the fact that breakfast is taken either in your room or in the (very) nearby sister hotel, but we enjoyed visiting the other place. Staff were great. Location perfect. Room clean and comfortable. Late check in possible via self service. Clean, very good location, fair priced. 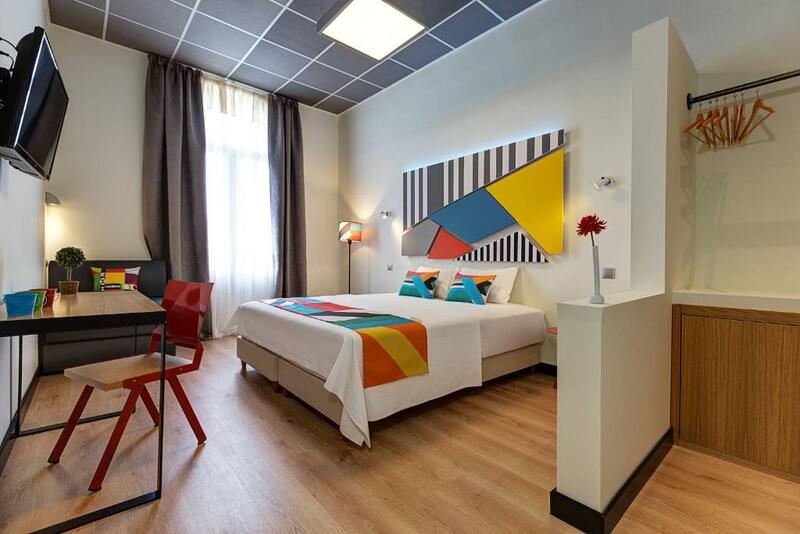 The hotel is right in the middle of a very lively area of bars and restaurants. This is extremely convenient but also means that some street noise filtered through to our room. Also the bar/cafe/restaurant are located at the sister hotel just 2 minutes walk away. Neither of these were a problem for us but could have been in different circumstances. Very well appointed rooms. Extremely friendly staff. Great breakfast. The hotel is located in the heart of the Thesaloniki. There are a lots of restaurans and pubs but there are everybody and there are disco as well. So it is very crouded and very loud from the evening till the morning. If you want to rest it could.be hard. There are lift from 1st floor so you have to go from the ground flour by hight stairs. Personel are very helpfull and they are speak english well.